Is eBay just a fad? Are you boycotting eBay this week? Bring on the ebay changes! Hello, anyone still out there? I know I haven't been around these here parts for some time. So here I am with an update. Last fall I sold my inventory of books on Craigslist and, after three or so years of active online bookselling, I have moved on to a new business. What I'm doing now is still applicable to you as an online bookseller so hang on. More on that a minute. 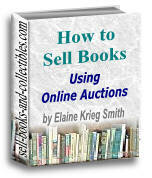 Online bookselling was a great way to get started with earning a living online. But, gradually, I reached the point where I'd have to outsource certain tasks to keep my sanity. Specifically, the packaging of the books and the taking of photos for eBay. The business had reached the adolescent phase and to get to the maturity phase I couldn't keep doing it all without outsourcing. Another strain was that I found it difficult to crack the $2K per month income ceiling. Which made paying for outsourcing not very tenable. I know, I know, a lot of people would think $2K per month is a great thing, and it was. But I have four kids, my husband was out of work for a while and debts racked up, so I was in need of more income. Anyway, writing has always been my first love and I discovered freelance copywriting. I now have a steady stream of clients and write for their online businesses. Email copy is my specialty. Essentially I discover and write about the stories of my clients' products and businesses. The income is much better and doesn't require schlepping to book sales or to the post office. I now know more than a thing or two about internet marketing and how to create websites. Several of my clients are millionaires and I've paid attention to how they run their businesses and various techniques they use. I know that with the recession going on you might be looking for ways to grow your business beyond just listing books on Amazon and eBay. Maybe you don't have a website yet. Maybe you've heard of things like Twitter and other social media and wonder if that would help. Maybe, just maybe, you'd like some passive income in addition to the income from your sales. For example, if you specialize in children's books, you could sell information based on your expertise. There's no end to what we could discuss about growing your business using the internet. I know there are already a lot of people out there who can tell you which books to look for, the best way to ship them and all that other stuff. But the last time I checked there wasn't any info out there about marketing for online booksellers. So if you'd like to see posts like that here, please leave a comment. Or send me an email. In the meantime, feel free to check out my copywriting blog. Even if you don't know the first thing about marketing or copywriting you might find it enjoyable. I tell stories and try to keep things fun and upbeat over there. It is fantastic to see you. My prayers on your new ventures! Sorry to hear you are out of the book biz. I'm still slogging along at it and it's doing quite well. It is a great deal of work and no way could I do it if I had kids! Buy famous author books online at low cost. Cool post as for me. It would be great to read something more concerning this matter. Thanks for sharing that info.